The western meadowlark was chosen in 1927 by a popular vote of Oregon school children sponsored by the Oregon Audubon Society. In July 1927, Governor I. L. Patterson issued a proclamation naming it the state bird of Oregon. No legislative action was taken. Western meadowlark declared to be official bird by gubernatorial proclamation (1927). 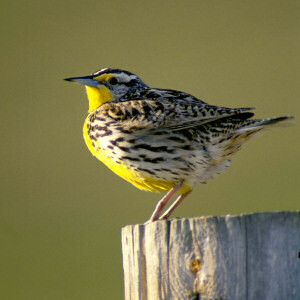 Western Meadowlark: Cornell Lab of Ornithology: All About Birds. Birds of Oregon: Field Guide: by Stan Tekiela. Birds of Oregon: A General Reference: edited by David B. Marshall, Matthew G. Hunter and Alan L. Contreras. Comprehensive reference to the bird species now known to occur in the state. Not a field guide.